The versatile Travelite EX - superior optics and advanced technologies in a lightweight, durable package ready for anything. 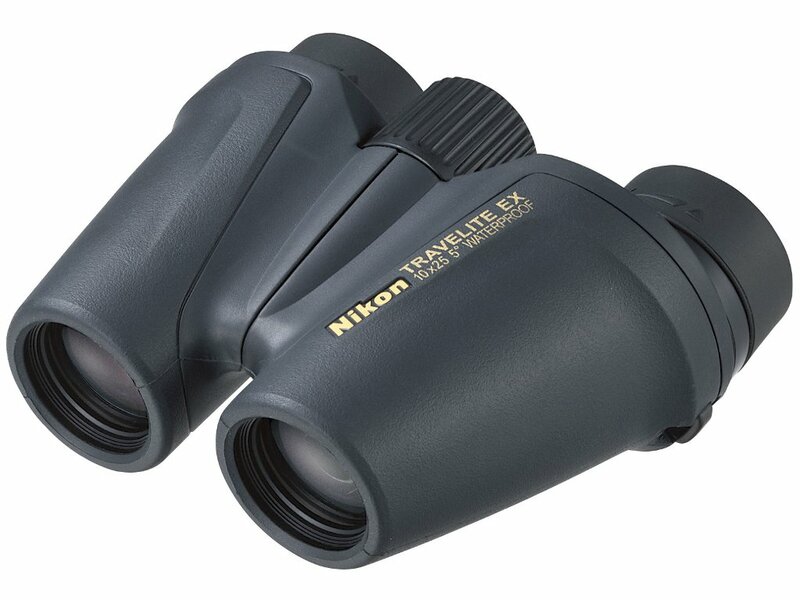 Whether you’re out scouting for wildlife or watching a rugby match, the Travelite EX binoculars from Nikon are versatile all-rounders, perfect for the great outdoors. Highly durable and lightweight, the Travelite EX range delivers sharp views come rain or shine thanks to a combination of superior optics and advanced technologies. Expertly crafted and available in a range of magnification powers from 8x-12x, these travel-ready binoculars are perfect for anyone who likes to take their binoculars with them wherever they go. The optical system of the Travelite EX is quite remarkable. Employing an objective lens diameter of 25mm in a high-quality Porro prism design optimises use of the compact dimensions ensuring these strong performing binoculars deliver a spectacular view. Even in poor light conditions superior light transmission is made possible thanks to Nikon’s multilayer lens coating resulting in bright, clear images. A close-focusing distance of just 2.8m provides superb flexibility in use while aspherical eyepieces work to eliminate optical imperfections and offer high-contrast edge-to-edge sharpness and clarity. Finally, eco-glass, free of arsenic and lead, is used throughout. Durable, compact and lightweight binoculars with medium magnification are ideal travelling companions. A wide field of view covers the playing area with 7x-10x magnification best for fast moving sports. For an enhanced view, zoom-type binoculars are extremely practical. Magnification of 4x-8x is recommended for general theatre use. For focusing in on individuals 7x-10x is most suitable. 7x-10x magnification is most suitable for nature viewing with 8x-12x models recommended for wildlife at a greater distance. A wide field of view is best for tracking birds in flight. Durability and portability are the perfect combination when enjoying rugged outdoor activities. Models which feature rubber armouring and waterproofing are ideal. Models featuring high-eyepoint design permit eyewear users a comfortable, full field of view. The Travelite EX is extremely practical with all models using waterproof and fog-free construction. With a robust housing, the binoculars are waterproof up to 2 metres for 5 minutes, and to prevent fog or mould from forming inside the optical system, Nikon have used O-ring seals and nitrogen gas, so a sudden change in weather won’t cloud your view. 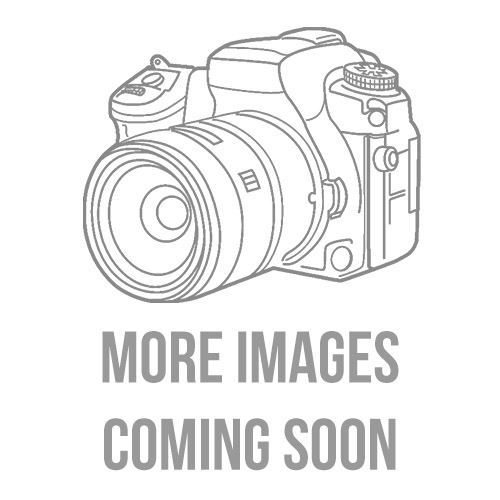 For ease of use, Nikon have provided features to ensure you get the very best from these versatile sports optics. So whether you wear glasses, contact lenses, or use your binoculars without either, you’ll have the perfect view of your chosen subject. Compensating for differences between your left and right eye, the click-type dioptre ring helps you achieve the sharpest possible image, while the high-eyepoint design provides a clear view of the entire field even when wearing spectacles. For comfort, the turn-and-slide rubber eyecups can either be positioned outwards, which provide a good eye rest, or folded back. A rugged die-cast aluminium body covered in rubber armouring for shock resistance means the Travelite EX range is ready for action. The rubber housing also provides a firm and comfortable grip for hands of all sizes, while the central focusing dial is ideally positioned for ease of use. Fitting easily into your pocket, these compact, lightweight binoculars also come with a carrying case that you can fit onto your belt for convenience, and a strap for when you prefer to wear them around your neck for instant access. 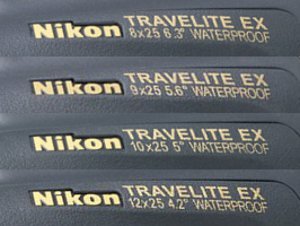 With a choice of magnification powers, the portable Travelite EX range from Nikon is perfect for nature watching on weekends away, and ideal for tough outdoor activities such as mountain climbing or trekking.